The transition from summer to fall always makes me nostalgic. And being the food-obsessed person that I am, that nostalgia often revolves around food. Food from my childhood, to be specific. I don’t know what it is about this interim time that makes me feel this way. Maybe the cooler weather jump starts my cravings for comfort food. Or perhaps the tendency to nest around this time of the year makes me miss that cozy family nest of my childhood and the warm and fuzzy feelings that can only come from a home cooked meal made by Mom. The things that I crave when I start down this sentimental path really don’t change much from year to year. Eggplant parmesan, eggs in a nest, cinnamon toast, scalloped potatoes, scrapple (don’t judge me)…. Lately though, my food nostalgia has been steering me towards plain old spaghetti with tomato sauce. I’m talking real spaghetti here, not linguine or angel hair. And I mention that because no one really does spaghetti anymore. As a kid, spaghetti was all there was. If you were having pasta for dinner, you were eating spaghetti. Anymore thought, there are just so many pasta shapes and sizes available in nearly every grocery store. 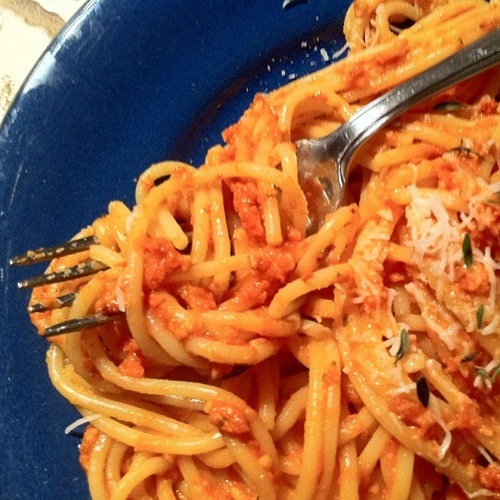 With all of that variety, spaghetti has sadly become the forgotten pasta. So I’m doing my part to bring it back. Now, I suppose I could have thrown together a quick marinara and served it with some old school spaghetti, but what’s the fun in that? Just because I’m feeling nostalgic doesn’t meant I can’t get a little creative. And so, with a little inspiration from the pile of tomatoes that I once again bought way too many of (they’ll be out of season again before you know it! ), this dish was born. Roasted tomatoes, garlic, and parmesan give it that familiar taste that I’ve been dreaming of, while the sundried tomatoes and thyme liven things up a bit to keep familiar from becoming boring. And to finish it all off, sliced almonds add some texture and beef up the protein content a bit for a more filling meal. It more than satisfied my craving for an old childhood favorite and is quickly becoming a favorite here in my grown-up nest as well. 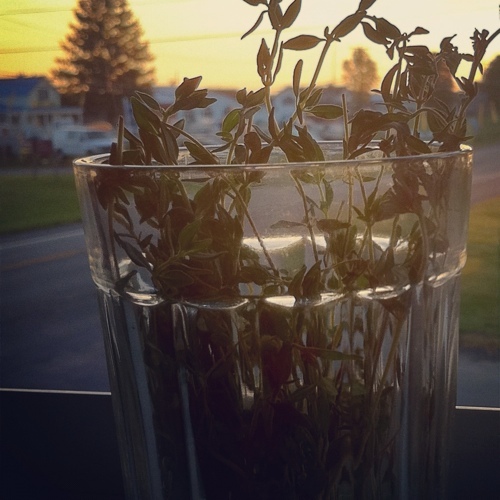 I used thyme in this recipe simply because it was what I already hand on hand. I’ve also made it with oregano and it was just as tasty. Feel free to use pretty much whatever fresh herbs you have readily available. I’m betting it would be delicious with basil, marjoram, or tarragon as well. Also, this will make more sauce than you’ll likely need for a pound of pasta. Leftovers are great stirred into some quinoa or couscous. Finally, if you don’t have a food processor you should be able to use a blender with similar results. Just add a little of the pasta water if things get stuck. Preheat the oven to 375 degrees. Slice the tomatoes in half horizontally and transfer to a large bowl. Pour 1/4 c of the olive oil over the tomatoes and season with salt and pepper. Toss to coat, then transfer the tomatoes to a foil lined baking sheet. Roast for 20-40 minutes, depending on the size of your tomatoes, or until the tomatoes lose their structure. Transfer tomatoes and any juices to a bowl. Put the sundried tomatoes in a small bowl and cover with boiling water. Cover the bowl with a kitchen towel and allow the tomatoes to soak for at least 5-10 minutes, until softened. Put a large pot of salted water on to boil. Once the water has come to a boil, cook the pasta according to the package directions. Drain and set aside, reserving about 1 c of the pasta water. Meanwhile, peel the garlic and process the cloves for a few seconds in the food processor. Strain the sundried tomatoes and transfer them to the food processor along with the roasted tomatoes and any of their juices. Process these until combined. Add the sliced almonds, parmesan, salt, and a little pepper. Process while adding the remaining 1/3 c olive oil in a thin stream until everything is well combined and fairly smooth. Taste for salt, and add more if needed. Remember that the saltiness will be less prominent once the sauce is added to the pasta, so it’s okay to oversalt just a bit. Add about half of the sauce to the hot pasta and stir to coat. Add additional sauce to your liking, and thin with a bit of pasta water if the sauce seems too thick. Mound the pasta in bowls and garnish with additional parmesan and thyme. I love sundried tomatoes! Your pasta looks great.